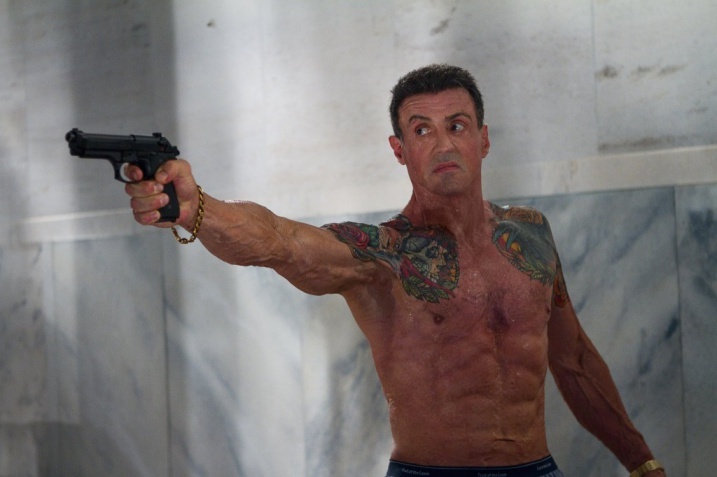 With a title such as Bullet to the Head staring a Sylvester Stallone with what looks like impressively low body fat of around 12% and directed by 48 Hrs (1982) and Red Heat (1988) Walter Hill, the story of this film was never likely to be overly complicated. Stallone is Jimmy Bobo, a low level, hit man for hire with a crime record as long as his muscled arm. We meet him and his partner on a job that does not go to the usual plan and Jimmy is targeted by his employers via the mercenary Keegan (Jason Momoa, Game of Thrones, Conan the Barbarian). Out of cold blooded expediency, Jimmy teams up with the out of town detective Taylor Kwon (Sung Kang) who is hot on the heels of Jimmy's connected bosses. Kwon as a cop is the young, noble technically minded antithesis of the hard boiled, career criminal, older Bobo. Bobo is immune to threats or fear except for his weak point - he has a fellow tattoo enthusiast that he wants to protect in his daughter Lisa (Sarah Shahi). The baddies, in the form of Christian Slater (yes Christian Slater!) as smug corrupt lawyer Marcus Baptist and complete baddie to the core Morel (Adewale Akinnuoye Agbaje), want to redevelop New Orleans. Both sides are primed for a collision as the bullets and punches fly. Bullet to the Head is so reminiscent of 1980s crime action films that in terms of style, setting and casting that it is a veritable tribute to the 1980s. Stallone's track record in such films is invoked in an unintentionally hilarious photo montage of him down through the years. 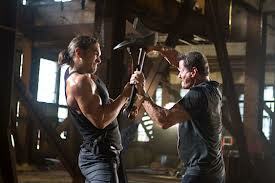 The fight scenes are more realistic than in the 1980s with real grit and brutality. That said, people tend to receive more conveniently 1980s bullets to the shoulder rather than to the head bar the expendable extras. Including the daughter-that-needs-to-be saved, there is a cavalcade of naked women with ski-sloped breasts paraded throughout the film the presence of which has very little to do with the film's narrative but a lot to do with the film's 1980s aesthetic. Momoa makes for a charismatic screen presence and the inevitable fight between him and Stallone garners one of the most memorable lines of the entire zinger filled movie: 'What are we, f@%ing Vikings?' Bullet to the Head is everything that was great and equally awful about the types of films Hill and Stallone made in the 1980s. It is quotable, silly, tough and unapologetic. That said, lovers of 1980s classics, might be advisable to wait for this straight to video fair tocome out on DVD or Blu-Ray.